Any business selling online should learn how to optimize their shopping carts so that as many customers as possible will go through with their purchases. According to a computation on Baymard.com the average abandonment rate for online shopping carts is roughly 65.23% – an overwhelming majority. Apart from completing their initial purchase, customers are likely to buy more products because of free shipping. A study conducted by Compete stated that 93% of online buyers are encouraged to buy more products if free shipping is included. Customers who received free shipping also ended up being more satisfied than those who had to pay additional fees. 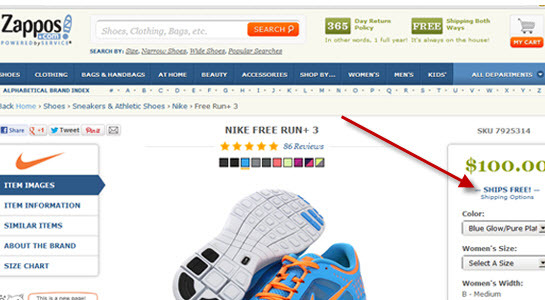 Zappo’s shopping cart is a good example of this, emphasizing free shipping at the top of the website, as well as within the item display on your shopping cart. While having free shipping is important to customers, it is said that they also hate additional surprise charges as they are checking out. WebCredible UK’s 2010 survey indicates that 49% of online shoppers abandon their purchases because of hidden fees that are only revealed upon checkout. 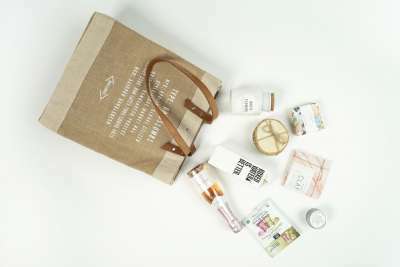 But if online shoppers dislike these surprise charges, how will business owners introduce additional variable charges such as sales tax, and specialized shipping? One way to do this is by adding a calculator or estimator within the shopping cart as early in the process as possible. 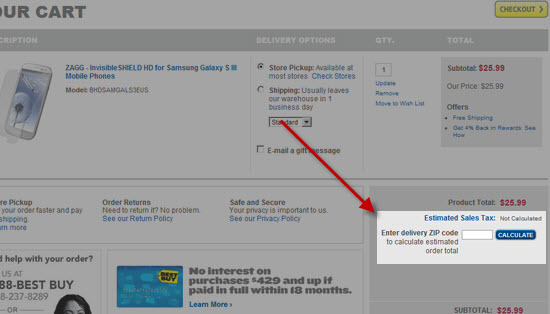 In the below example, Best Buy’s shopping cart has a built-in sales tax calculator to avoid any additional surprise charges for customers. It can be tricky (and therefore frustrating) for customers to keep backtracking and navigating a site just to find their existing shopping cart and check the items ready for purchase. Though it’s simpler from a technical standpoint to create customer shopping carts on a separate page from your e-commerce store, customers need ready access to the cart regardless of the page they are on. In one report, Movies Unlimited allowed its online shoppers to see their existing cart via a dropdown menu, rather than navigating to a separate page. This led to an estimated decrease in cart abandonment of 4% to 8%. The below screenshot highlights this kind of feature in action. 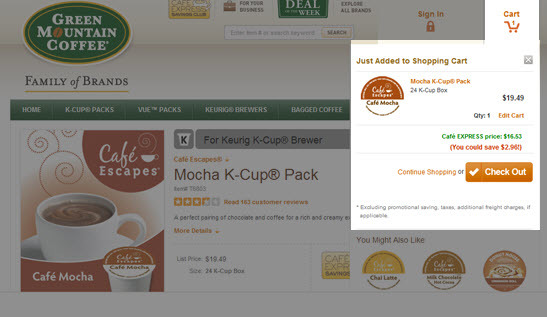 In Green Mountain Coffee’s example, the shopping cart shows up on the top right side of the screen whenever you add a new item to the cart. 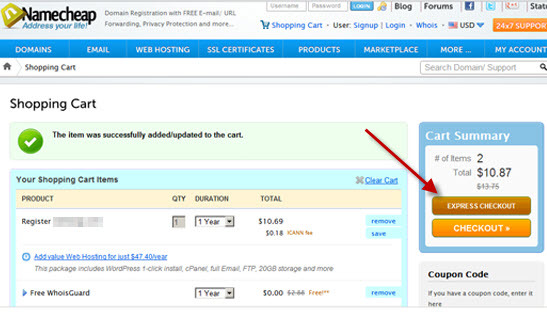 You can also easily make the cart viewable, if you want to check it as you’re shopping. The Webcredible report also mentioned that around 10% of respondents abandon their shopping cart because of a lengthy checkout process. These are most likely multi-page checkouts that keep presenting customers with additional forms, questions, or products. But what if these additional options are necessary? This is where a feature like “Express Checkout” comes in. In the below example, NameCheap provides customers with an “Express Checkout” option where, while viewing their cart, they can immediately check out and complete the purchase. 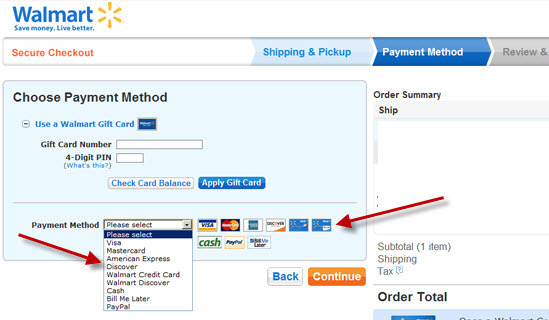 The below example shows Walmart’s extensive list of payment options for their online store. These include a variety of credit cards, third-party online payment services such as PayPal, and even Walmart rewards cards. Apart from these digital payment options, they also receive payments for online purchases via check. According to Walmart representative Cynthia Lin, check payments help them reach more customers. “Initial data show we’re reaching customers who have not bought from us before,” she said. Just because a customer abandoned their shopping cart, it doesn’t mean that the transaction is over. In the same report about Movies Unlimited, they stated a 1.5% rise in transactions just by sending out email campaigns to remind customers of their abandoned carts. As a result, customers either purchase the “abandoned” items, save them for later, or clear the cart. This move makes sense because the Forrester study also found that 41% of online shoppers who abandon their carts do so because they are unprepared to make the purchase. Therefore, online store owners should give customers the option to complete their purchase when they are ready. Apart from email reminders, another way to remind customers to return to abandoned carts is the “Save for Later” or “Wishlist” feature, which is prevalent in most online shopping carts from established retailers. Amazon is a leader in this department with its several “Wishlist” features. 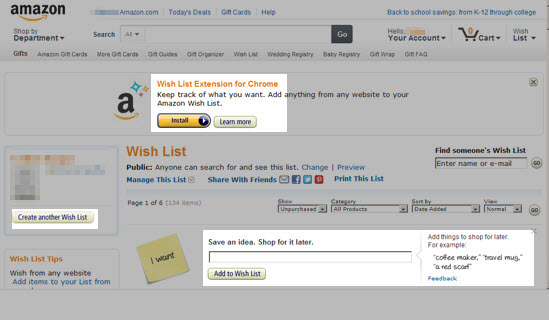 You can create multiple wishlists, add a “Wishlist Add-on” for your browser so you can bookmark items from other websites, you can also jot items down and shop for them later. Also, if they see that you’ve browsed specific items or categories, they’ll send you fully customized emails reminding you to buy these items. Webcredible’s study shows that 29% of online shoppers do not like proprietary registration forms during check out. In fact, one respondent stated that because of their existing number of passwords, they feel inconvenienced when yet another service requires them to create an account. But how can you track customer activity without inconveniencing your customers? Walmart is a great example of this. As you’re checking out, they give you 3 options for your account. 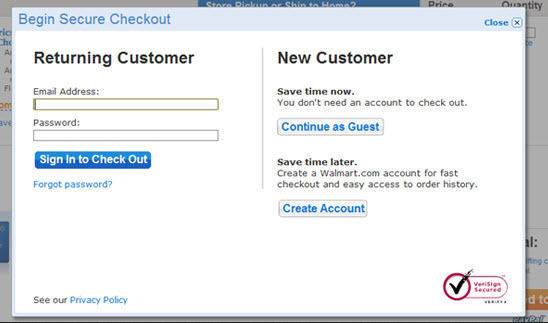 You can login with your existing Walmart account, register now, or wait until later to create your own Walmart account. This puts less pressure on the customer, knowing that he or she can complete the transaction without registering. While an email address is still required, creating an online Walmart account is not. E-tailing’s 2011 Connected Consumer survey showed that the website features online shoppers found essential were high quality images, ability to see the item in their preferred colors or styles, alternate views of the item, and zoom functionality. 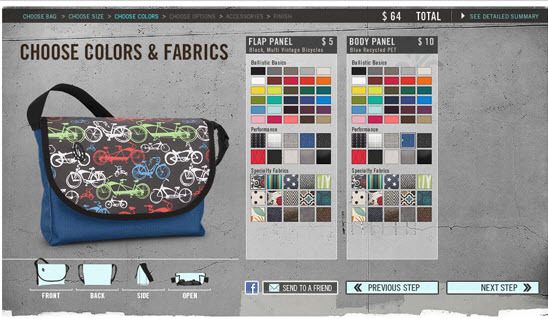 The below example from Timbuk2 is a great example of this, since the pictures dominate the screen, can be viewed from different angles, and clearly display what the item will look like when you’ve customized it. The same E-tailing survey showed that 62% of online shoppers think it’s important for an e-commerce website to have sections for specially priced items. These include items on sale, coupon codes, and items being cleared from inventory. In the example here, sale items are prominent on Steve Madden’s website, including specially assigned sections for sale and clearance items. 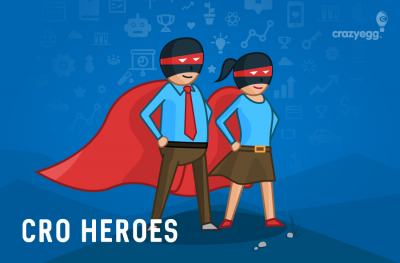 As you can see, these tips aren’t just for improving conversion rates, they help make for a better customer experience as well. By applying even just a few of these tips to your shopping cart, you might see your sales increase, while providing a better, easier online shopping experience for your customers as well.